This edition of the Collector's Corner was written by Dave McCormick. All of us hockey fans and those who have ever attended any business conference over the past twenty years know the old Wayne Gretzky cliché of “you miss 100% of every shot you never take.” I also know that jersey designs, like art, and because they are like art to us collectors, are highly subjective in their appeal. In fact, designs that were once ridiculed are now some of the most desirable (looking at you Canucks’ “Flying V” and Islanders' “Captain Highliner”!). So, I praise teams for taking their shots at trying new designs. However, you certainly don’t score on every shot you ever take and sometimes, you outright fan on the puck that leads to horrible consequences for the team; especially if you’re playing in a beer league tournament with a goaltender who took the “beer” in beer league a little too literally (argh…tendies!). With all due respect to those who attempted their jersey design shots (and I’m the first to respect that it’s much harder to design than it is to critique) and to those that like them, I’ll point out a few current designs that missed their targets and how they could be improved. The Parley initiative by Adidas to blend athletic performance footwear and apparel with sustainability and environmental stewardship must be applauded. 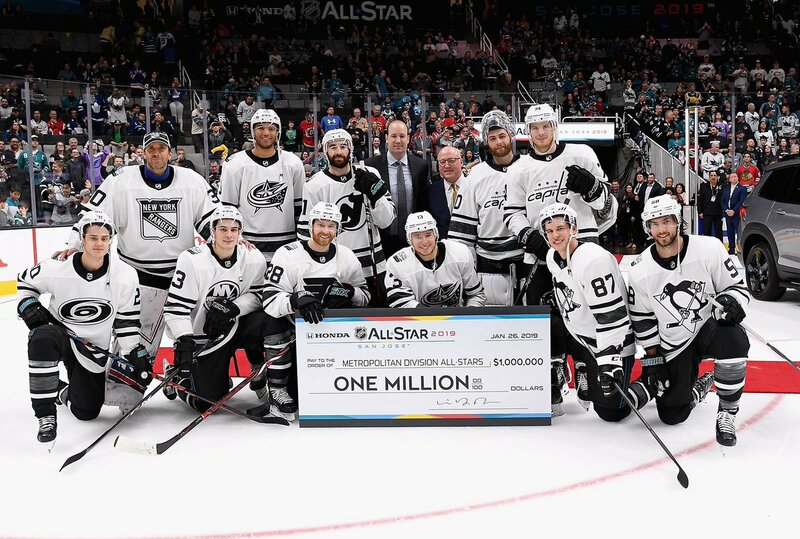 According to their website the Parley collection of 2019 NHL All Star Game jerseys that will be seen in San Jose are “created with yarn made in collaboration with Parley for the Oceans. Some of the yarn features Parley Ocean Plastic™ which is made from recycled waste, intercepted from beaches and coastal communities before it reaches the ocean.” While the initiative is a great effort to provide a solution to a real problem, the execution of these jerseys, based on much feedback on social media and among collectors, missed the target. Recent ASG jerseys featured the NHL shield as the primary crest with bold, bright colours and design cues that reflected the jerseys of the host city’s team, such as these beauties from the 2016 game in Nashville. 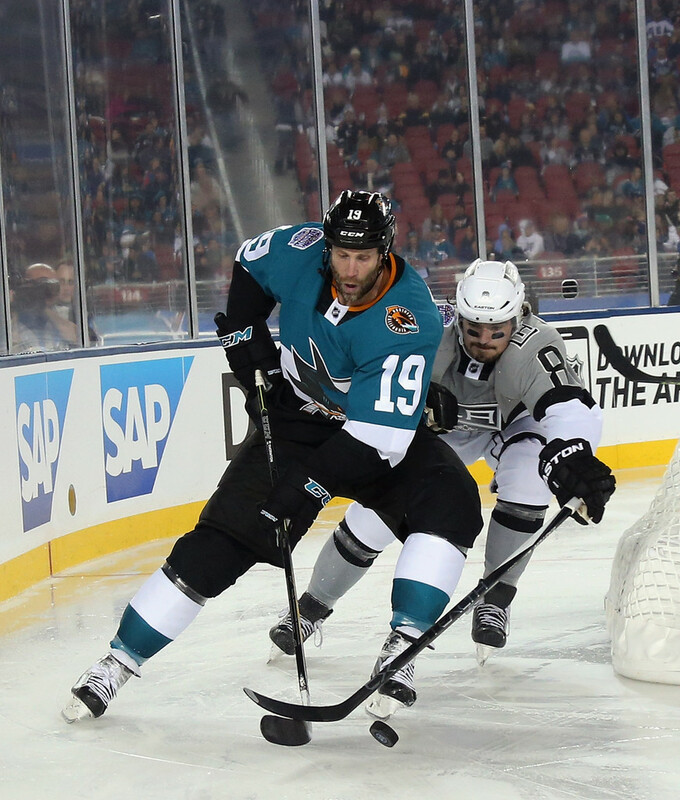 This year’s Parley jerseys use a rather bland black, white and grey palette and the All Star player’s team crest as the primary logo. Adding some colour would really make these jerseys stand out and help receive more positive attention to a worthy initiative behind their manufacturing. Speaking of bland jerseys in San Jose, their 2018-19 “Stealth” alternate jersey design is also guilty of being too dark. I know that’s the concept of being stealthy but isn’t the point of uniforms to stand out and be seen? I’m quite impressed how their use of teal has stood the test of time when it was a fad colour choice across sports in the 1990s. Their copper trim, which has made varied levels of appearances over the years is an underused colour in sports and a touch of it on this look, such as the copper heavy NorCal patch worn on their 2015 Stadium Series jersey would get this shot on target. These Sharks’ uniforms are definitely stealthy as it’s really hard to see anything distinguishable. All or near all black is only positively representative of New Zealand rugby. Clearly, going dark is a major design trend in today’s NHL. In fact, it seems to be that way across all fashion as what we wear often reflects society’s general attitude. Unfortunately, today’s political climate in North America and global security issues may, in fact, be dominating the designs of one of our favorite “escapes” and what drew us to hockey jerseys in the first place – big, bold, bright logos and colours that look awesome skating around a white sheet of ice at super-human speed. 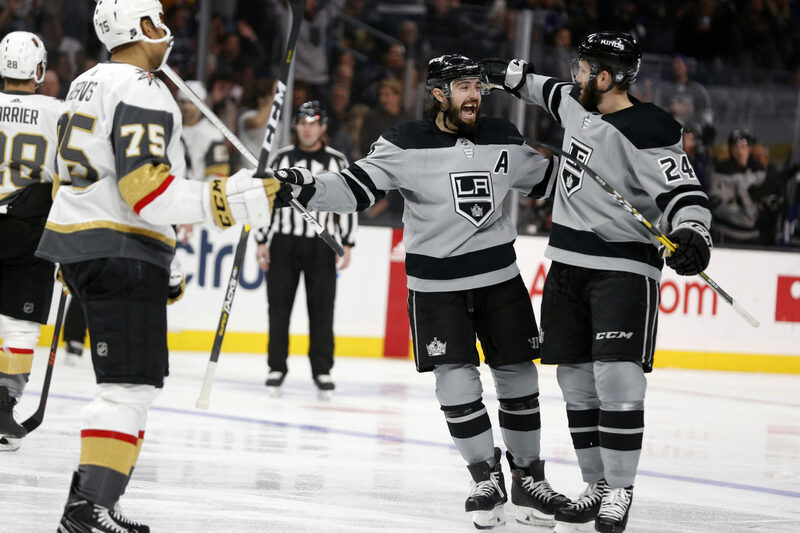 The LA Kings have a great colour and design history that is reflected in one of the most iconic franchises that they’ve shared a building with for decades in the LA Lakers. 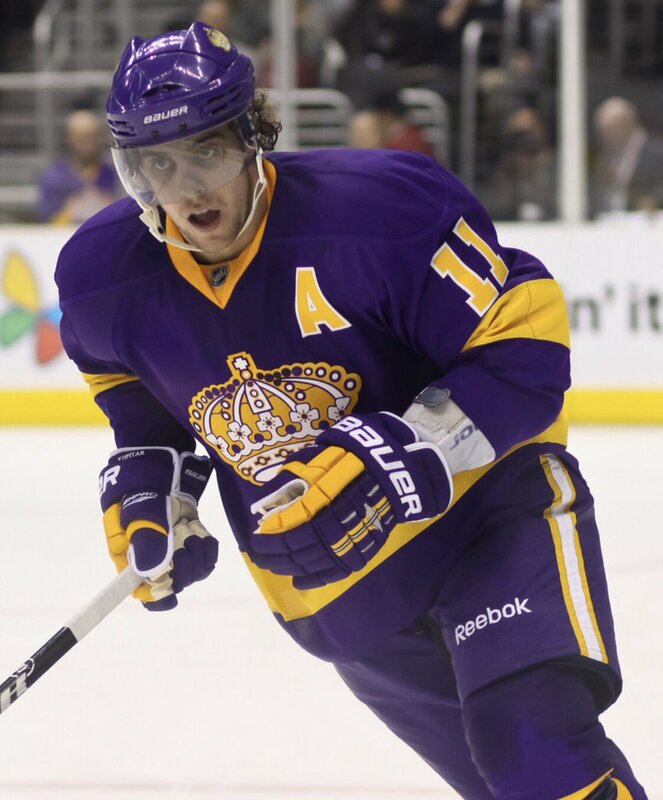 Just show any long time sports fan a gold and a purple shirt without a logo and they’ll likely think about LA teams. So, while the black and silver became cool when Gretzky came to LA we need some more colour to brighten our lives! So, their newly revealed grey jersey just seems to hang on top of the ice like a depressing rain cloud. 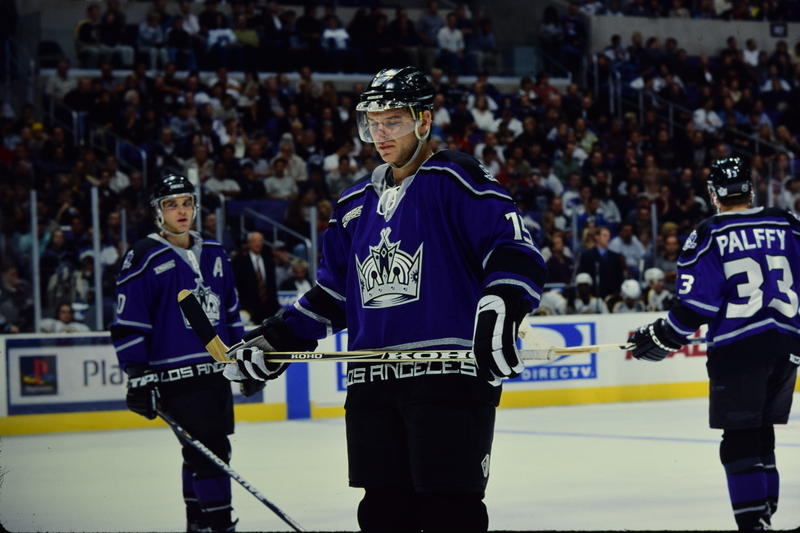 The Kings have used purple along with the black and silver quite successfully throughout the late 90s and early 2000s and have even brought back their vintage purple and gold unis for special occasions over the past few years. Let’s see more of those and less fanned shots where it looks like their design artists only had access to a #2 pencil! Lastly, another recent missed shot is the 2018-19 Winnipeg Gets – I mean Jets – alternate jersey. As readers of my blogs know, I grew up idolizing the original Winnipeg Jets and felt huge pride when the City got an NHL team back. So, it’s with great anticipation and expectations when the Jets announce a jersey reveal. Unfortunately, I was disappointed by these. However, at least they employ a great colour! The use of the team’s Aviator Blue trim colour from their primary jerseys is a great choice as the main colour. The simple sleeve and hem stripes using their navy blue and white are fine even though it smacks of Finland national team template. The issue with the jersey is mostly with the script of the team name as the front crest. The “J” in Jets looks way to much like a “G”. I appreciate the subtle silhouette of a fighter jet to cross the “T” in jets – it’s actually pretty cool. I was hoping they would have added some red trim, red name bar, or, at least, a unique number font to match the script of the crest to make it truly stand out. Instead, this jersey is a very plain, uninspired attempt at duplicating what was a very cool original WHA look for the original Jets franchise in Winnipeg. Luckily, I think most teams have done a good job with their jersey designs. Not every design can be as iconic as the Detroit Red Wings or Chicago Blackhawks regular home and road uniforms. What they can do, though, are use splashes of colour while doing their best to pay respect to their past while moving forward into the future of the game.